Graphic design services & 3D rendering design for new products, banner stands, tradeshows exhibits, book cover, business cards, exhibition booths, brochures, flyers & banners for Vermont VT! When you need a graphic designer or 3D rendering design firm in Vermont, VT call on Capital Exhibits to create the very best graphic design ideas for your company. We provide a wide range of printing services such on Vinyl, fabric, mesh, canvas, static cling, self-adhesive vinyl for indoor and outdoor use. Whether you are located in Burlington, Essex, Colchester, Rutland, South Burlington, Montpelier or any of the surrounding areas, you’ll get service that’s on time and on budget. Rated a top 3D design & graphic design company in business graphics and trade show design, our team of professionals is here to meet all of your design outsourcing needs. We offer a wide variety of trade show displays such as retractable banner stands, portable exhibits, pop ups and tabletop displays. There are also numerous possibilities for incorporating technology into your displays with the availability of interactive kiosks, monitor stands and even personalized QR Codes. We also print directly on fabric, canvas, static cling at HD quality. Combining traditional printed materials with technology devices helps create a lasting impact on your potential customers. All of our products are guaranteed and built to last from show to show. 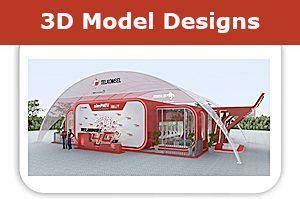 See our 3D design gallery for more ideas. Looking for one-stop service? We’ve got it. Let us create a branding design package that focuses on increased brand awareness and overall return on investment (ROI). In the many years we have been in business, the focus has always been on promoting the success of our business partners. Graphic design images and advertising developed by our team of contemporary graphic designers can be included in your display. Let our banner design artists create a unique design that draws customers in while our attention-grabbing brochure design work and graphic design business card services provide take-home material for them as well. We listen and incorporate your ideas among all stages of creative development to ensure the results represent your brand as best as possible. Our experts take the time to make sure you are equipped for your next major trade show or event! 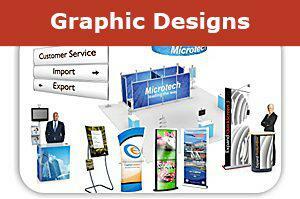 Our team of trade show graphic design specialists can make custom exhibits that use many different components. Because our team is located in-house, we are able to minimize turnaround time and middleman costs for our customers. Meeting your business goals in Vermont doesn’t have to be difficult. Call and speak to one of our design experts for more information about logo design prices, print design pricing, and all other graphic design quotes & rates. Call (866) 730-3746 to speak directly with a member of our team, or send us an email at [email protected].